Born and raised in New York. 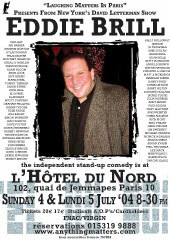 Eddie Brill is the warm-up comedian and the talent coordinator for the comedians on "The Late Show with David Letterman"Brill is a respected stand-up comedian here in the USA and abroad. He has been a regular on the comedy scene in England since 1989. He also works regularly in Ireland, France, Amsterdam and Hong Kong. He does a lot of corporate work, emceeing of major events and charity work for many different causes. 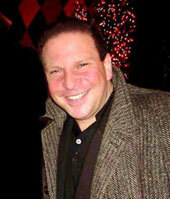 Eddie received the MAC Award for the Best Male Comedian in New York, three years in a row. He has appeared in over 100 TV shows in six different countries. He has acted in many films including, "Drop Dead Rock" with Adam Ant and Deborah Harry, "Burnzy's Last Call", with Sherry Stringfield, Chris Noth and David Johansen and "30 years to Life" with Saturday Night Live, Tracey Morgan. He was also seen in the Comedy Central series, "Contest Searchlight" with Denis Leary. He also teaches a Comedy Workshop at Gotham Comedy Club in NYC, where he works with both seasoned and aspiring comedians to fine tune and layer their performances. Whenever Eddie gets some time off from the David Letterman show (he books their comedians, warms up the audience and does a trun on TV himself every now and again, he hot foots it to Europe for his and our pleasure. A very funny big hearted man he thrilled us last summer an we've been inundated with requests to bring him back. New York's Eddie Brill, has survived and thrived as a stand-up in the Big Apple, being thrice voted Best Live Act at the US Comedy Awards. More recently Eddie guested on the David Letterman Show and at the moment he's also chief writer for the legendary Saturday Night Live show. 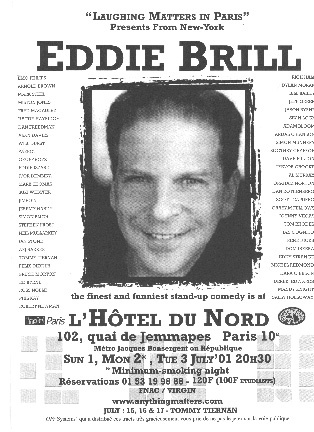 A truly gifted comedian, actor, and writer, Eddie Brill continues to thrill audiences, both young and old, with his high energy, intelligent, and insightful brand of comedy. Eddie headlines in major rooms around the US from Carolines in New York City to the MGM Grand Hotel in Las Vegas, and has also appeared at Carnegie Hall, Town Hall, and The Shrine Auditorium. Most recently, Eddie rocked Radio City Music Hall when he opened for Aretha Franklin. 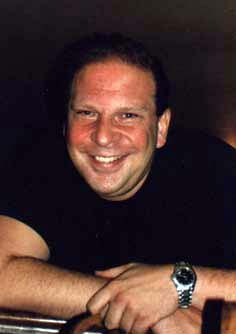 A Favorite in England, Eddie Brill has been seen and heard on British TV, radio and working the comedy clubs in London since 1989. He has also filmed over thirty television shows in three different countries, and has appeared at the Montreal Comedy Festival. Coming up for Eddie is the release of three motion pictures: Drop Dead Rock, with Adam Ant and Deborah Harry; Burnzy's Last Call, with Chris Noth, David Johansen, and Sherry Stringfield: and he just recently complete "Neptune's Rockinghorse".